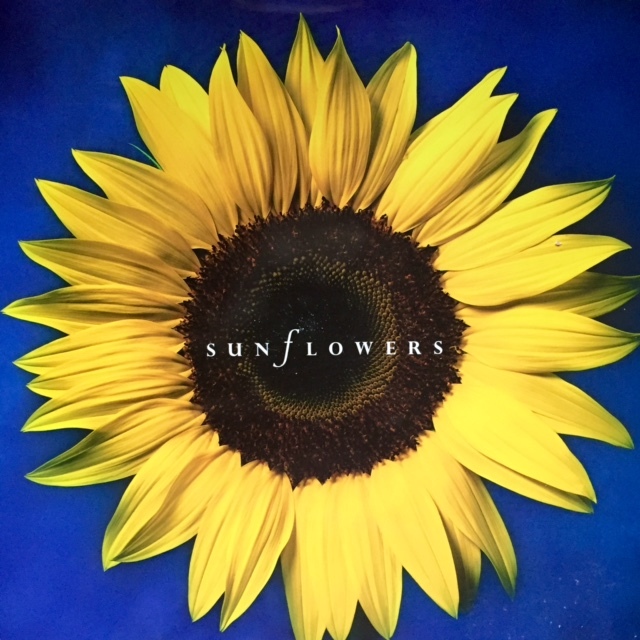 From the cover of the book SUNFLOWERS, by Courage Press. 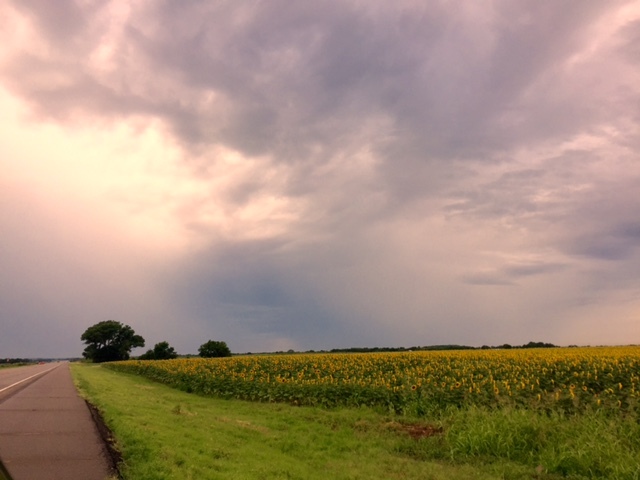 This huge field of sunflowers manages to stand up to the grandeur of our vast Oklahoma skies. I do believe that given the chance, sunflowers could bring about world peace. I mean really. Is there anyone on earth who is not cheered by its sunny nature? Captivated by the wondrous spiral of seeds in the heart of its radiating petals? Fascinated by the way they turn their heads towards the sun as the day ages? Compelled to smile at their presence? I think not. My friend Catherine just wrote a wonderful post about their history and magical nature on her blog In the Garden and More: the Magical and Majestic Sunflower. A good read for the curious on a hot day in August. 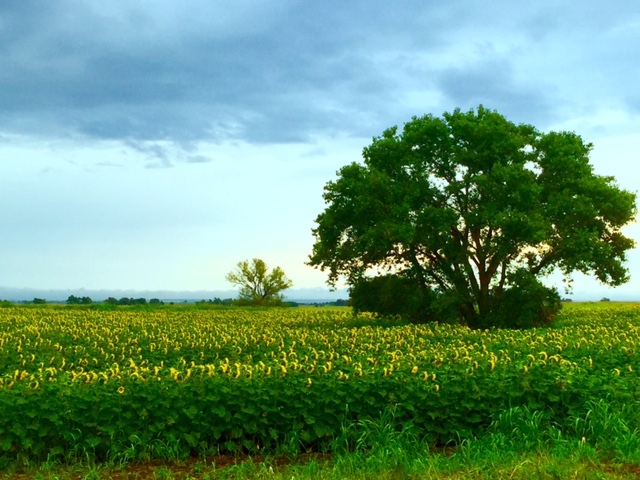 Two lone trees seem to erupt out of a field of sunflowers. I have long been smitten by this most quintessential summer bloom....my favorite is the pollen less Sunbeam variety with its fresh light green center. I've taken a thousand pictures of all varieties of sunflowers in my garden over the years...against the crystal blue backdrop of an Oklahoma summer sky. Catch some of their garden beauty in the potager in a previous post Expressions of a Sunflower...or in this post "Sunflowers: Nothing Gold Can Stay" striking and grand as each individual bloom reaches for the heavens. For more sunflower eye candy and poetry, I pull out my book SUNFLOWERS by Courage Press (which you can find for as little as a penny on Amazon here) each season, leafing through its pages for inspiration and compensation for late summer heat. This season I am more captivated by their beauty en masse, absolutely blown away by the muscular magnificence of huge expanses of sunflowers looking in unison towards the infinite summer sky. 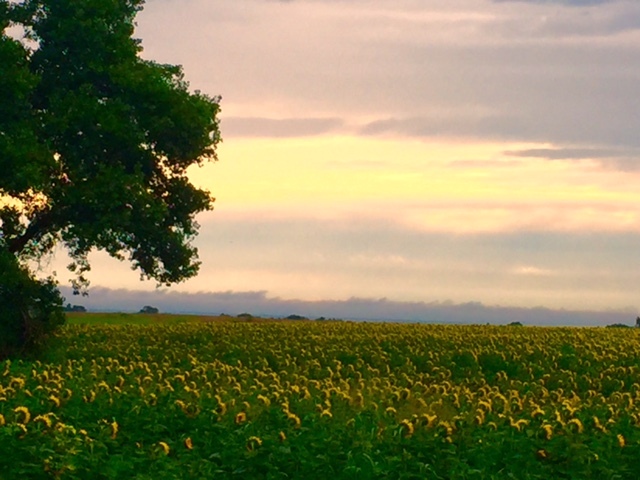 I took these pictures en route to Colorado in July, frequently bringing our road trip to a halt so I could snap just one more....and then one more again as the color of the sky, or the backdrop of the sunflower field changed. Golden sky, golden blooms, golden summer. Husband should take most of the credit for these images...calling my attention to them, and away from my book, so as not to miss their grandeur. Breaking up the prairie landscape with their golden nodding heads; breaking up a long drive with a glowing field of happiness. It seems to me that these sunflowers are in the midst of some animated conversation. Speeding by in the car...hesitant to say good-bye. Sunflower, I bow to thee in awe, in gratitude. As beautiful from behind as from in front....with a gray sultry sky as a background.